NEW YORK (Reuters) - Elon Musk's job as Tesla Inc's chief executive appeared safe on Thursday as a federal judge in Manhattan urged the billionaire to settle contempt allegations by the U.S. Securities and Exchange Commission over his use of Twitter. The hearing appeared to lift an overhang over Tesla, as the SEC stopped well short of recommending Musk's removal as chief executive or even from the electric car company's board. "What this is to the SEC is strike two, and if there is another transgression they might seek a director and officer bar," said Peter Henning, a law professor at Wayne State University in Detroit and a former SEC lawyer. "They are just trying to send a message: be more careful." 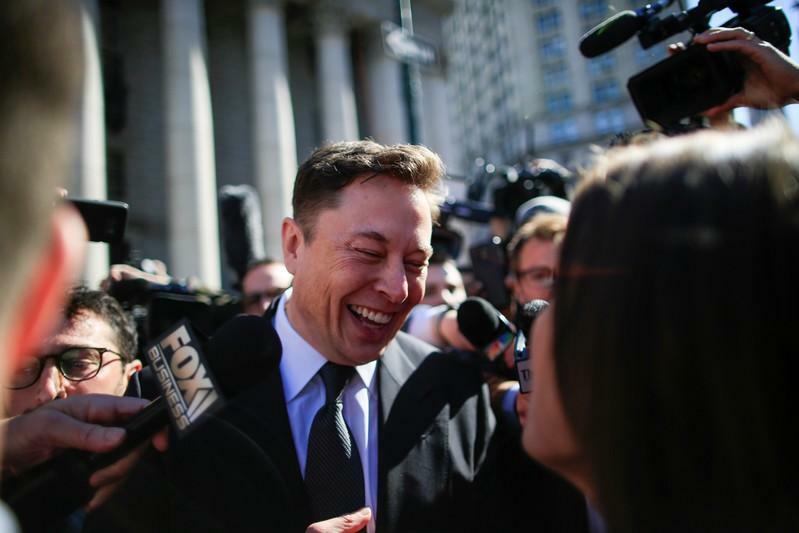 Musk declined to discuss the hearing as he left the courthouse, surrounded by a horde of reporters, photographers and television cameras, but said "I feel very loved here." Nathan had been asked by the SEC to hold Musk in contempt over a Feb. 19 tweet where the regulator said he improperly posted material information about Tesla's vehicle production outlook without first seeking approval from its lawyers. Tesla's share price tumbled on Thursday, after the company on Wednesday night reported lower-than-expected vehicle deliveries, but recouped some of their early losses after the SEC declined to demand Musk's removal. The battle concerned a tweet that Musk sent to his more than 24 million Twitter followers: "Tesla made 0 cars in 2011, but will make around 500k in 2019," meaning 500,000 vehicles. The SEC said the earlier tweet conflicted with Tesla's Jan. 30 outlook, when it targeted annualised Model 3 production exceeding 500,000 as soon as the fourth quarter, and projected 360,000 to 400,000 vehicle deliveries this year. At Thursday's hearing, SEC lawyer Cheryl Crumpton said that if Musk were held in contempt, the regulator might ask Nathan to require regular reports about his oversight by Tesla lawyers, including whether they vetted his statements and if not why. Noting that Musk had called his $20 million fine "worth it," Crumpton said the threat of higher potential fines might also be needed to convince Musk that further violations would be "not worth it." Since it began last September, he has labelled the SEC the "Shortseller Enrichment Commission," recalling his attacks on investors who sell Tesla stock short. And in the early morning of Feb. 26, after the SEC filed its contempt motion, Musk tweeted: "Something is broken with SEC oversight." "A fine is not going to be that big of a deal for him," said Henning, the Wayne State law professor. "A key question is going to be how much is Musk going to dig his heels in and refuse to accept any additional conditions."